Bob Weighton, who had a 25 year career at City and is the UK’s oldest man, is celebrating his 110th birthday. 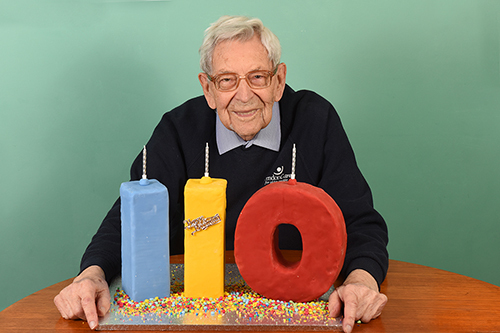 Former City academic Bob Weighton is celebrating his 110th birthday today, which he shares with fellow supercentenarian Alf Smith. They are Britain’s oldest men, born on 29th March 1908. Although Weighton and Smith have never met, they do exchange birthday cards every year. Bessie Camm, the UK’s oldest woman, is a little older than the pair at the age of 113. Weighton joined City as part of the Engineering department in 1947, where he worked as a Senior Lecturer in Mechanical Engineering until 1973. He recalled lecturing the students as being his fondest memory of the University. “I wanted to go back to the Far East, but I realised there was no way of getting back. So I went back to my engineering, and then lectured at City University in London for 25 years. Then it was a technical college, none of the high-brow subjects they have now,” he told the Observer. Born in Yorkshire, Weighton was one of seven children. After finishing school at 16, he qualified as an engineer through an apprenticeship. With little work around due to the Great Depression, he left the country in 1933 and spent time living in Japan before teaching in a missionary school in Taiwan. During the Second World War, he spent time living in Canada and the USA and recalls a change in attitude of Americans after the attack on Pearl Harbour. It was after returning to the UK that Weighton joined the Engineering department at City. “I have no idea why I’ve lived so long, I just haven’t died yet, that’s all,” he succinctly explained to the Observer.